IP2P has irrefutable proof, including video, that United Airlines has been deliberately exposing its employees and the public to deadly amounts of airborne asbestos for financial reasons over the past four years. United Airlines' position that A&E Services Inc. was not removing asbestos from United's former WHQ in Illinois not only illustrates the unbelievable arrogance of management at United. It also confirms that the culture endorsed and implemented by the top brass at United is one of: When caught doing something wrong, lie to the bitter end. That way of dealing with this very serious situation, if continued, will not serve you or United's shareholders well in the days to come. Now would be a good time for someone at United Airlines to say something intelligent. 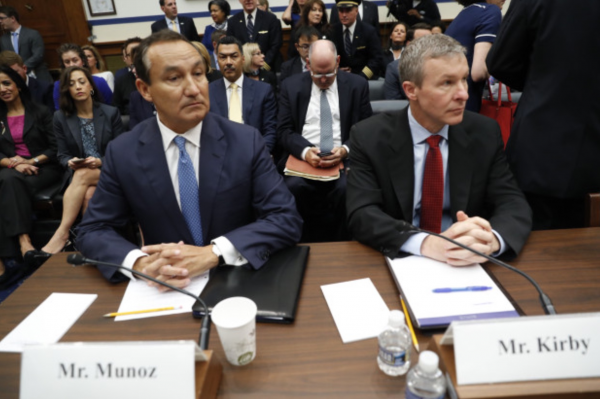 Oscar Munoz, you have admitted that stuffing a puppy into an overhead bin to die was wrong. Now perhaps you can also muster up the decency to admit that United got it wrong when it decided to deliberately expose people to a known carcinogen. Oscar, I realize that this will be a very difficult thing for you to do considering that the decision to purposely expose people to asbestos was not only wrong, it is also against the law! But whether or not you do the right thing and voluntarily accept responsibility, United will be held accountable for its actions. Crooked FBI Director Robert Mueller suppressed truth in Plamegate! » « United Airlines is killing more than just dogs and bunnies!